Capitol Corridor trains generally do not require an advance reservation, so it’s easy to just buy a ticket and ride. One-way tickets enable you to ride one-way from departure station to destination. Round-trip tickets allow you to ride from departure station to your destination and back. Tickets are valid on board any Capitol Corridor train/bus at any time between the stops noted on the ticket. There is a multi-city booking option as well if your plans include more than one destination. A 10-Ride (45-Day) ticket is good for 10 discounted one-way trips, valid for a 45-day period between the stations listed on the ticket, or any station in between. Any trips not used within the 45-day period are forfeited. Ten-ride tickets are non-transferable and are only good for the person whose name appears on the ticket. Designed for regular riders, a monthly ticket is good for unlimited rides during the calendar month for which it is issued between the stations named on the ticket or any station in between. Monthly tickets are non-transferable and are only good for the person whose name appears on the ticket. Capitol Corridor’s service area is extended greatly through a number of dedicated, connecting bus routes to destinations such as San Francisco, Lake Tahoe, and Monterey. If your trip involves a bus connection, your ticket will include the route’s designated bus segment, as well as the rail segment. If you are beginning your trip on a bus without a ticket, you will be required to temporarily surrender your photo ID to the bus driver. Please note that unless you are traveling between Emeryville and San Francisco, most connecting bus trips require an advance reservation. Tickets purchased online, from a station ticket agent or at a self-service Quik-Trak machine, are issued as electronic tickets, or eTickets. If you book your ticket online, you will receive an email receipt with your eTicket attached as a PDF that can then be printed out or pulled up on your mobile device. If you purchase your ticket from a station agent or Quik-Trak machine, you will receive the ticket at the end of your transaction as a paper ticket; it will not be emailed to you. You can also buy your ticket and access it from the Amtrak mobile app. You must show your ticket (paper copy or pulled up on your mobile device) to the train conductor once seated or bus driver upon boarding. You may be asked to present a valid photo ID. Read more about ticket policies. Capitol Corridor fares vary by origin-departure stations. You can view station-to-station train fares on Capitol Corridor’s Fare Chart for One-Way/Round-Trip, 10-Ride, and Monthly tickets (effective July 16, 2018). You can also check fares (including fares for trips with a bus segment) by typing in your origin and destination on the Capitol Corridor homepage, or by calling 1-877-9-RIDECC (1-877-974-3322). Please note that the San Francisco Bay Area Clipper fare payment card is not available on the Capitol Corridor. Capitol Corridor offers a variety of discounts for seniors, children, disabled persons, and members of select organizations. See applicable discounts. Capitol Corridor often has seasonal discounts and offers from regional partners. View our current offers. Groups of 20 or more passengers traveling together are eligible for a group discount. View the Group Travel page for details. Our Train Treks program, especially designed for school groups, also offers discounted travel. Learn more about Train Treks. Capitol Corridor offers Transit Transfers that allow you to ride connecting buses and light rail free of charge. We also offer pre-loaded Clipper cards and SF MUNI tokens on board trains, and trains have direct connections to BART at both the Richmond and Oakland Coliseum stations. Read more about transit connections and transfers. Federal law allows workers receive up to $255* a month in employer-paid tax-free transit costs, or take up to $255 a month in tax-sheltered payroll deductions for transit costs. See Pre-Tax Tickets for details. Buy one-way and round-trip tickets at staffed stations, online or at Quik-Trak machines. Quik-Trak is a self-service ticketing kiosk located at selected stations. If you’ve booked your reservation online, you can pick up and print out your tickets at a Quik-Trak kiosk. 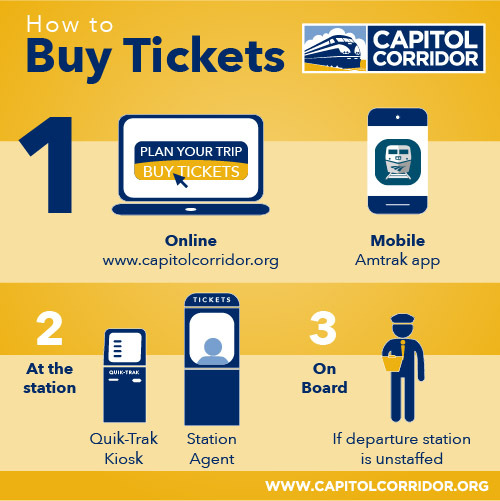 Reservations are not required for travel on Capitol Corridor, so you can walk up to a Quik-Trak machine and purchase your ticket right before you hop on board the train. $ = Additional fee charged for purchasing a ticket on board the train when boarding at a staffed station. To avoid fees, purchase your ticket online, from the station agent or at a QuikTrak machine, if available.